See photographs of all the shops, shopping centres, restaurants, hotels, cafes and bars on our Virtual Streets only a short walk from the John Smith's Stadium. Plan your shopping and eating before your visit with our interactive map. We also cover many villages surrounding Huddersfield. 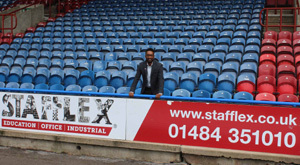 The new deal involves Stafflex branding to appear on a number of different advertisements such as on the LED screen at the stadium, on the club’s website and in the chairman’s notes. Stacking cups are also available to purchase at PPG Canalside Fanzone throughout the season. the region's experts in temporary and permanent recruitment. The Stafflex Arena is located in the middle of the Yorkshire countryside just 8 miles out of Huddersfield in the Farnley Estate. Formerly known as the Storthes Hall Sports Complex, The Stafflex Arena is now owned by The Leslie Foundation and is home to over 30 amateur football clubs. It is also the base for Huddersfield Star Wheelers as well as Huddersfield Town Ladies Football Team. 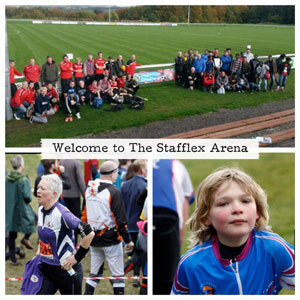 Other than football, The Stafflex Arena hosts a variety of events including Orienteering, cross-country cycling and Crufts Dog Show (regional heat).